Let's face it, unless you're able to spend hundreds of dollars at the groomer's, you're probably going to give your pooch a bath in your own bathtub to cut costs. This can dramatically change the look and utility of your bathroom if you're giving your pooch monthly baths, so there are a few things you should keep in mind. 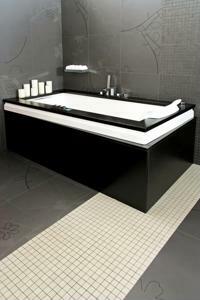 First and foremost, you should look for a bathtub that is raised higher than traditional pieces. This can help to ease the strain on your back when you're washing your dog and it can prevent water from splashing all around your bathroom. You should also look into a detachable shower head that can make rinsing off your pooch much easier. You can opt for a design that can be removed all in one assembly or a combination of a detachable shower head and a permanent fixture. This can go a long way towards making your doggy bath a lot less messy and remove any traces of soap on his coat in the process. Dog owners will be forced to make some special preparations for their furry friend, but your bathroom will still be conducive for your needs. What bathroom accessories are a must in a dog-friendly home?